Being Indians we know about past life and karma briefly. 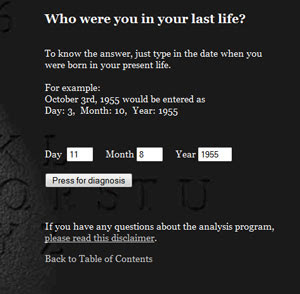 Here's a site that tells you the same by entering your birth-date into it. A very brief analysis, funny too. Do yourself a favour and take it with an ABSOLUTE PINCH OF SALT. That's not a cat that's a lemur!